My role on this dig is to try and interpret visually what we find in the ground or more frequently so far on this site what we don’t find. My background is as a landscape architect land manager and environmental planner, in my career I was used to trying illustrate what places might look like in future, in archaeology I try to imagine what places looked like in the past. Firstly although I’m no Victor Ambrus from Time Team it does seem that we both start the same way on any project. Before the excavations commence I try to research the periods we are expecting to excavate, I concentrate on climate and vegetation, typical building styles of the period particularly in relation to the vernacular of the locality . What did they eat? how did they hunt or fish?, did they grow crops? The way we understand that people may have clothed themselves is particularly important. Did they have textiles? for instance, in the Mesolithic period in Scotland we think they probably utilised the skins they processed from the animals they hunted for food. The post glacial climate was unlikely to have been conducive to going unclad this far north. I download all the relevant images and articles that I think might be helpful, gather my camera, laptop, drawing materials, reference books, folding chair, thermal trousers, woolly hat and packed lunch (not necessarily in that order of priority) and head for the dig. Tarradale is a beautiful location on the shore of the Beauly Firth and this year the soft autumnal weather has been mostly kind for the archaeologists and volunteers. A bonus for me is that there has been somewhere dry in doors for me to concentrate on drawing, its not easy if there is a wind blowing or your hands are so cold you can't hold a pencil, rain makes it impossible. First of all I took photos of the locations of the trenches and the surrounding landscape so that I could put any illustrations in context. As the dig has progressed in the various trenches I have been able to interrogate the archaeologists as to what they were finding. Any sketches or illustrations drawn during the course of an excavation are part of an iterative process and are likely to be modified several times based on new insights as further evidence is revealed or the expert advice of specialists. There is no place for precious protection of the illustrator's work, it is a collaborate exercise with the aim of being as historically accurate as possible. 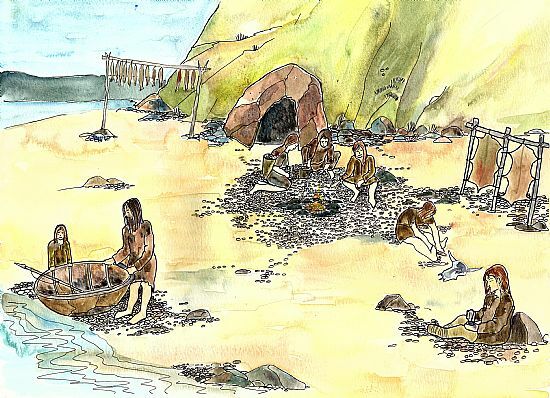 On a site where excavation reveals walls, remnants of clay floors and wattle and daub and the shadows of post holes emerge, as was the case in the Cromarty Medieval Dig, it is easier to start to reconstruct in drawings how the buildings and townscape may have looked. This has not been the case so far at Tarradale. Trench 1A has was excavated in area where previous finds indicated that the location had potential as a possible castle site. At the present time it has been concluded that there is no remaining evidence of any structures in the vicinity of the trench. However photographic records show that there was a large bank at the top of the relict cliff of the raised beach on the seaward side of the trench at least 3 to 4 metres higher than present ground levels and at least 12 metres wide comprising stratified fluvio- glacial deposit. This was removed several years ago but it has been posited that this bank was potentially large enough to have been the site of a timber tower/castle overlooking the Beauly Firth. 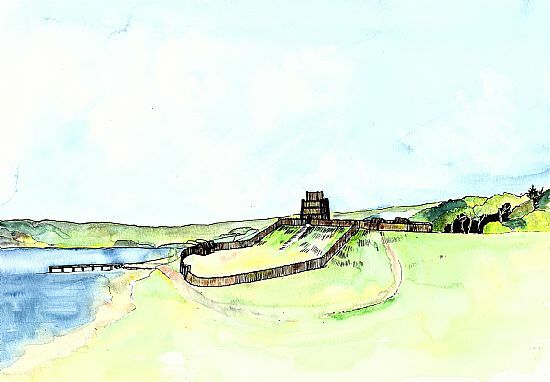 No evidence remains in this location but historical records including Timothy Pont refer to a castle at Tarradale and so I have drawn a sketch of what such a hypothetical structure might have looked like in this location (see below). The Tarradale Through Time project is investigating the site of a possible medieval castle and some early prehistoric shell middens near to Tarradale House. We have opened several trenches to target areas where lots of medieval pottery has been collected during fieldwalking and where some faint geophysical anomalies were identified. After cleaning and excavating it became clear these anomalies were geophysical in nature, so unfortunately no evidence of a castle! Does this mean the castle elsewhere or is it just completely truncated by successive ploughing and modern landscaping? At the base of the relict cliff on a raised beach, trench 1C is currently being excavated. A scattering of shells had indicated that there might have been a shell midden in this location and dark soil deposits potentially could have been evidence of burning. Whilst we do not know at this stage and may never find conclusive evidence as to exactly whether there was a temporary camp or a more permanent settlement, I have worked on a visualisation of what daily life might have been like for the people living here (see top of post). Both illustrations can be seen if you visit the open day on Saturday 30th September.